Coleraine celebrate Darren McCauley's goal. A second half goal from Darren McCauley was enough to keep Coleraine in the hunt for the Danske Bank Premeirship title. The midfielder fired home a long range effort to give the Bannsiders all three points against their derby rivals Ballymena United at The Showgrounds. 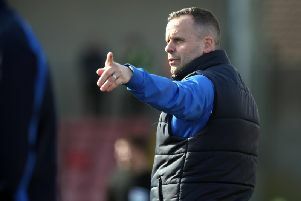 The result not only keeps Oran Kearney's men within goal difference of Crusaders at the top of the league, but also means Coleraine have gone the whole season unbeaten at home. There was a glut of chances for both sides in the first ten minutes. Coleraine skipper Stephen O'Donnell headed straight at Ross Glendinning from Josh Carson's corner on six minutes. Ballymena hit back a minute later with Matthew Shevlin forcing a smart save out of Chris Johns at his near post. Seconds later Stephen Dooley released Jamie McGonigle, but the striker's low shot was deflected away for a corner by the outstretched leg of the keeper. The Sky Blues stopper tipped over a long range effort from Eoin Bradley on ten minutes as the hosts ramped up the pressure. Another swift break by Coleraine on 21 minutes saw Bradley send McGonigle clear, he did well to tee up Darren McCauley, but he was off balance and shot wide. Oran Kearney's men put another good move together eight minutes before the break as Dooley crossed from the byline, Harkin flicked on for Lyndon Kane, but his low shot was deflected wide. McCauley broke the deadlock on 56 minutes as he drove a low shot past Glendinning from outside of the box. The wide man should have done better when he found space in the box on the hour mark, but this time he fired over. Coleraine should have made it 2-0 a minute later after Johnny Flynn lost the ball. McCauley combined with Traynor, but the midfielder scooped his shot over the bar. The home side should have wrapped up the points with four minutes to go as they caught Ballymena on the break. Burns found Dooley who in turn fed Carson, but the ball bobbled just as he struck it and ended up well over the bar. Right on full time Tony Kane curled a free kick inches wide of the target after Ervin had been brought down. There was more drama in stoppage time as Carson was shown a straight red for a challenge on Willie Faulkner. And right at the death McAlorum had a curling effort tipped over by Johns.